Life is filled with simple tricks that can make everyday tasks a whole lot easier. Sometimes, things are more simple than we realize. For example, instant cake batters used to come with powdered eggs, but it turned out people were more likely to buy cake mix if they had to add an egg. It’s almost in our nature to make things unnecessarily complicated and ignore basic life hacks. Bright Side has collected a list of things you need to stop doing wrong as soon as possible. There’s a cool hack to help you quickly make a drink cold. Just wrap a wet paper towel around your beverage and put it in the freezer. You’ll have an ice-cold drink in as little as 15 minutes if you are using a 20 oz bottle (give it a little more time if you have a larger bottle). At the end, the frozen paper towel just slides off. A metal straw can also help keep the drink cold, improve the taste, and even help the environment. The image of an apple with a bite on its side is so iconic you’d think there was no questioning it. Wrong! Eating an apple starting from the side is the perfect way to waste around one third of the fruit! Eating from top to bottom will help you eat as much of the fruit as possible. Think of the money you’d save on produce. It also looks lovely. Just take a look at that star! To save on the hassle of going to a local store to buy more toothpaste, people around the world try to squeeze as much as they can out of the tube. There is another way: cut the tube open. Not only does it make reaching the toothpaste easier, it even allows you to collect the toothpaste that would have been left behind by squeezing anyway. Bananas have cheated and lied to you your entire life. You know that thing on the top...the stem that connects it with the rest of the bunch. You think it grows with the stem to make it easier to open. But it’s all a trick. Opening a banana from the bottom actually causes less mess, even eliminating those strings. If you eat pizza like they do in stock photos, you are doing it wrong. When eating a slice, you should fold it in half. Eating your slice like this makes for the best crust/topping ratio, makes things easier to hold, and it also helps hold in the toppings. In other words, this helps whether you prefer crust or toppings. There is no reason not to do this. And in addition to that, it also creates an instant calzone. Getting your nails done can make your hands look pretty, but it also makes your hands utterly useless until the polish dries. Sure, you could blow on your nails like a child, but there is another way. Placing your nails in ice water is a nice, relaxing way to get your polish to harden as soon as possible. When dealing with the other kind of nails, we’ve all seen cartoons where the bumbling handyman accidentally hits his own hand while trying to hammer down a nail. The poor schlep is fine by the next scene, but real people aren’t as lucky. However, there is a way to keep your hands out of the fire. Use a clothespin to hold it! Clothespins can also be used to hold down tacks. If you know how to iron your clothes and you do it regularly, then you’ve succeeded at being a functional adult. However, there are ways to make less work for yourself. If you regularly straighten your hair and have a straightener, you can use it to save time while waiting for the iron to heat up. It can also help you smooth out wrinkles in a quick and handy manner. Did you know that Elizabeth Montgomery did not actually twitch her nose on the Bewitched TV series, but instead moved her lips? Facial movements are funny like that. If you are taking a photo and need to crack a smile, you can squint your eyes to help your smile look more genuine. If you spend more than 5 minutes trying to figure out which of your keys unlocks your front door, there’s a way to make things simple. Just color your keys using nail polish and memorize the keys by color. If you have loose cords around the house, you could collect them all in a box. Maybe you already do this, but there is an easy way to organize them without much work. Toilet paper rolls are easy to collect and they make the perfect tool to hold loose cords. It also makes them easier to take out. Alternatively, you can also make these rolls out of leather. When using paint straight out of the can, it’s easy to make a mess with the brush. But, there is a simple fix. Place a rubber band around the can so that it cuts through the opening. This forms an easy way to wipe the brush without making a mess and it also stops drips. Trying to peel a hard-boiled egg is so frustrating that it makes you wish you just poached the eggs. Fortunately, there is another way. 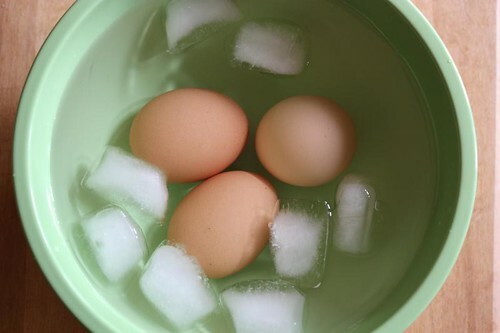 After your eggs have cooked, just quickly place them in ice water. This will make cracking the egg all the easier. Also, make sure your eggs have had enough time to cook or you may have just made a mess for yourself. If you have a can of soda, then you might try to drink it by sticking a straw in the opening. This is technically correct, but you could have still overlooked something that might make the task much easier: the tab can be folded back to hold the straw in place. This can help prevent the straw from floating around. If you like to run, you probably buy special sneakers to exercise with, but you might overlook one quick-fix: the heel-lock lacing technique. Ever notice those extra holes in your shoes? Pass the laces through the opposite loop, pull tight, and tie in the front as usual. Doing this gives us more support in the heel area. What do you think of these hacks? Are there any you have that you’d like to share? Let us know!